Back in the early 1990s, Sega released the Sega CD, a disc based add-on for the Genesis, in order to expand upon the system’s capabilities. Unfortunately due to a flood of FMV games that were released for it initially, the Sega CD was panned by many gamers at the time. As such, many missed out on one of the best gems for it: Sonic CD. In an effort to expand the hype for their upcoming Sonic 4 Episode 2, Sega has updated and re-released Sonic CD as a downloadable title for the PS3 and Xbox 360. Is the updated game up to snuff and enjoyable to play today, or does it fizzle into obscurity? If you have ever played a Sonic game before, you will feel right at home with how Sonic CD plays. Sonic runs, jumps, hordes rings like an addict in order to stay alive, and spin dashes his way from level to level toward the seemingly never-ending goal of stopping Dr. Robotnik. Aside from the normal suite of skills, this game also introduced the rarely seen super peel out. This move was very similar to the spin dash in that it can be used to get moving quickly. It is faster than the spin dash, and Sonic will maintain that speed as long as he’s moving; however since Sonic is not curled up during it, he is vulnerable to being hurt. 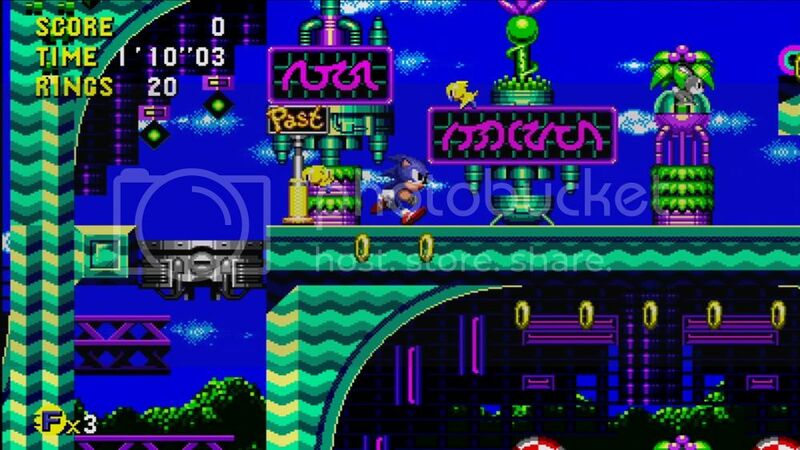 It is a novel idea, but within the level design of Sonic CD its uses were rather limited and under utilized. 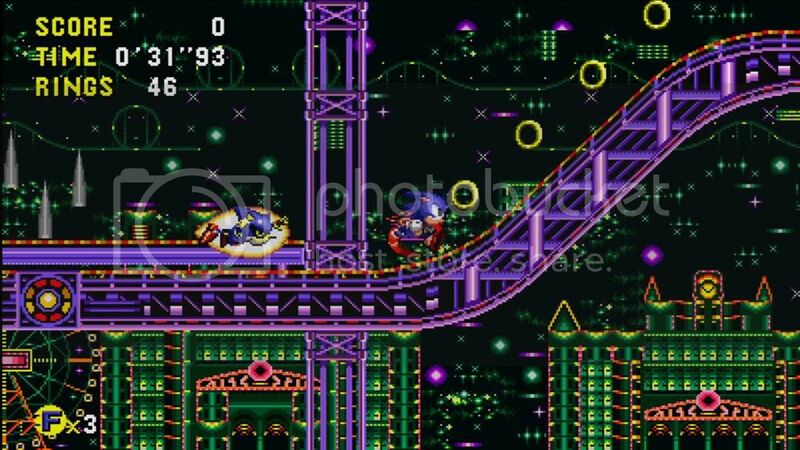 The layout of each level in Sonic CD at first glance is interesting. Players will come across seemingly random rings and item boxes strewn about the environment. No, it is not a glitch or bug in the game’s code. In actuality they are hints at one of the prominent features of Sonic CD: the ability to time travel. Sonic is able to move forward and backward through time and see alternate versions of each level. Minus the boss acts, each level has four variations, and each variation has multiple changes from placement of tunnels/objects, enemy placement, hazards, music, etc. Each version is so wildly varied that it keeps the experience fresh each time you play through a zone. The time travelling aspect to Sonic CD did more than provide level variety. Unlike the other games in the series, exploration of each zone was encouraged. Players could fly through the present or future levels if they wanted, or travel to the past to find and destroy a robot generator in order to create a better future, which in turn leads to a better ending. It gives the player a choice in how they want to tackle the game, and provides different ways to replay it. However despite being slightly different in layout, the good future versions of each level can be a bit underwhelming. The game does not give much incentive to travel to the future after working to make it better other than a warm fuzzy feeling of seeing what has changed. Aside from traveling to the past and destroying generators, Sonic CD also gives players the option to improve the future by collecting all seven time stones. The time stones are collected by finding them in special stages, which are accessed via collecting 50 rings and jumping through a large ring at the end of a zone. Unfortunately, the special zones in Sonic CD are possibly some of the least enjoyable ones in the series. They involve destroying half a dozen or so UFOs withing a time limit, and utilize a Mode-7-like visual effect to create a 3D effect with 2D sprites, which did look neat for its time, but it makes judging jumps difficult. So many times I would jump at a UFO, but end up completely missing despite visually looking like a hit. Also, the visual style makes some of the hazards tricky to see coming since they only appear as a 2D texture on the ground. Sonic CD also takes some strides and experiments with platforming gimmicks throughout the levels. Some are designed well and are fun to check out like Stardust Speedway’s switch posts that alter whether Sonic interacts with the foreground or background and Quartz Quadrant’s switchable conveyor belts. They really support the exploration and variety aspects that Sonic CD emphasizes. However, some are not quite as fun; Wacky Workbench’s floors that send Sonic flying into the air sticks out. Flying 2-3 screen lengths into the air in moments is not enjoyable when you cannot see or dodge hazards above you until it is too late. Despite some flops in gimmicks, there are still some refreshing ones to balance the experience out. The boss fights of Sonic CD are one of the bigger highlights of the game. Traditional Sonic boss fights are typically avoiding specific attack patterns, striking the boss at certain gaps, and repeat 6-8 times. Sonic CD deviates from the norm by making boss fights more creative than an attack/dodge fair. One boss makes you run on a conveyor belt dodging bombs while melting away the platform under Robotnik’s feet. Another highly memorable “fight” is a race between Sonic and his biggest rival: Metal Sonic. As varied and different the bosses are, they are also for the most part easy and will not provide much of a challenge aside from one or two. Beyond the main game, Sonic CD also includes a time attack mode for all the speedrun/time trial aficionados out there. It supports timed runs of every one of the game’s levels and special stages, and is fairly standard affair. Though there is one minor gripe regarding the PS3/Xbox 360 release: being able to quick reset out of a level. In the original Sega CD version, it was possible to pause the game and press A to reset back to the time attack menu, and restart the level with a single button press. In the re-release, that’s no longer an option; instead players have to pause, navigate to the bottom of the menu, and quit to the time attack menu. Even then the cursor defaults to exit, so the player has to navigate back to the start option before restarting. It is a fairly minor issue, but for speed runners who will restart on the slightest mistake or misjump in order to optimize their runs, the extra time needed to do so may be bothersome. 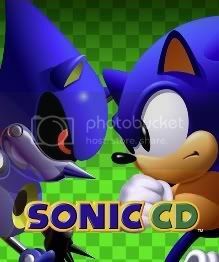 So how does the PS3/Xbox 360 release of Sonic CD compare to the original? For the most part, the conversion is incredibly accurate and faithful to the original. There were a few small changes in some levels in order to prevent players from time warping accidentally; thus making those spots no longer viable as warp points. The only issue I had was with a small glitch with moving objects that could crush Sonic. Whenever there’s a cylinder/piston in a hallway, in the original (and most Sonic games) you could press Sonic against it, and the moment a gap opens big enough he would move on. In the re-release if you press against it, the moment the gap becomes a pixel or so shorter than Sonic the game will register him as being crushed, and you’ll lose a life. It is not a game breaking glitch, but it is rather obnoxious to deal with. 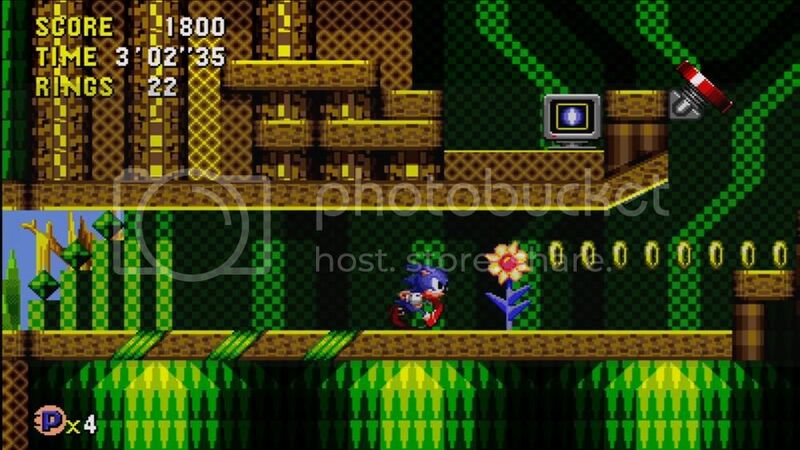 Visually, Sonic CD still looks pretty good for a game that originally came out nearly 20 years ago. Levels can be a bit on the busy side, but they still hold distinct looks from each other. The updated widescreen presentation for the re-release is a nice touch that helps for viewing areas further in front of Sonic, which allows the player to better react and jump. The game has also been scaled up to HD resolutions, and through the use of filters makes the transition nicely. Nothing seems to be horribly pixilated outside of the special stages, and in general pleasing to the eye. A very nice added feature for the updated release of Sonic CD is the ability to choose between the original Japanese soundtrack and the US one. While it has been debated which one is better, each version has its own distinct qualities. Some are more quirky sounding than others, while some seem to be more atmospheric. It would have been nice to be able to pick which version you want on a per level basis. Regardless, it is great having the choice between both. Overall, Sonic CD is by far a worthwhile game of the Sonic franchise. After decades, the level design still holds up. It experimented with some aspects; some turned out well, and some not so much. The updated version for the PS3 and Xbox 360 is incredibly accurate to the original aside from one or two minor quirks. Sonic CD provides a great value for anyone who enjoys a plaforming game, and any Sonic fan really should not be without this game whether the original Sega CD release or the updated one.
? Why was the quick reset removed?